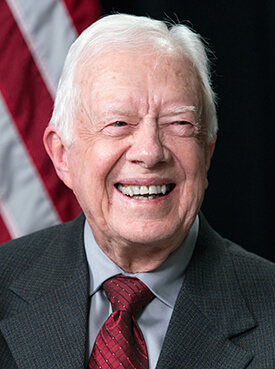 Jimmy Carter (James Earl Carter, Jr.), thirty-ninth president of the United States, was born October 1, 1924, in the small farming town of Plains, Georgia, and grew up in the nearby community of Archery. His father, James Earl Carter, Sr., was a farmer and businessman; his mother, Lillian Gordy Carter, a registered nurse. He was educated in the public school of Plains, attended Georgia Southwestern College and the Georgia Institute of Technology, and received a B.S. degree from the United States Naval Academy in 1946. In the Navy he became a submariner, serving in both the Atlantic and Pacific fleets and rising to the rank of lieutenant. Chosen by Admiral Hyman Rickover for the nuclear submarine program, he was assigned to Schenectady, New York, where he took graduate work at Union College in reactor technology and nuclear physics and served as senior officer of the pre-commissioning crew of the Seawolf, the second nuclear submarine. On July 7, 1946, he married Rosalynn Smith of Plains. When his father died in 1953, he resigned his naval commission and returned with his family to Georgia. He took over the Carter farms, and he and Rosalynn operated Carter's Warehouse, a general-purpose seed and farm supply company in Plains. He quickly became a leader of the community, serving on county boards supervising education, the hospital authority, and the library. In 1962 he won election to the Georgia Senate. He lost his first gubernatorial campaign in 1966, but won the next election, becoming Georgia's 76th governor on January 12, 1971. He was the Democratic National Committee campaign chairman for the 1974 congressional and gubernatorial elections. On December 12, 1974, he announced his candidacy for president of the United States. He won his party's nomination on the first ballot at the 1976 Democratic National Convention and was elected president on November 2, 1976. Jimmy Carter served as president from January 20, 1977 to January 20, 1981. Significant foreign policy accomplishments of his administration included the Panama Canal treaties, the Camp David Accords, the treaty of peace between Egypt and Israel, the SALT II treaty with the Soviet Union, and the establishment of U.S. diplomatic relations with the People's Republic of China. He championed human rights throughout the world. On the domestic side, the administration's achievements included a comprehensive energy program conducted by a new Department of Energy; deregulation in energy, transportation, communications, and finance; major educational programs under a new Department of Education; and major environmental protection legislation, including the Alaska National Interest Lands Conservation Act. Mr. Carter is the author of 32 books, many of which are now in revised editions: Why Not the Best? 1975, 1996; A Government as Good as Its People, 1977, 1996; Keeping Faith: Memoirs of a President, 1982, 1995; Negotiation: The Alternative to Hostility, 1984, 2003; The Blood of Abraham: Insights into the Middle East, 1985, 1993, 2007; Everything to Gain: Making the Most of the Rest of Your Life, written with Rosalynn Carter, 1987, 1995; An Outdoor Journal: Adventures and Reflections, 1988, 1994; Turning Point: A Candidate, a State, and a Nation Come of Age, 1992; Talking Peace: A Vision for the Next Generation, 1993, 1995; Always a Reckoning, and other Poems, 1995; The Little Baby Snoogle-Fleejer, illustrated by Amy Carter, 1995; Living Faith, 1996; Sources of Strength: Meditations on Scripture for a Living Faith, 1997; The Virtues of Aging, 1998; An Hour before Daylight: Memories of a Rural Boyhood, 2001; Christmas in Plains: Memories, 2001; The Nobel Peace Prize Lecture, 2002; The Hornet's Nest: A Novel of the Revolutionary War, 2003; Sharing Good Times, 2004; Our Endangered Values: America's Moral Crisis, 2005; Palestine Peace Not Apartheid, 2006, 2007; Beyond the White House: Waging Peace, Fighting Disease, Building Hope, 2007; A Remarkable Mother, 2008; We Can Have Peace in the Holy Land: A Plan That Will Work, 2009; White House Diary, 2010; Through the Year with Jimmy Carter: 366 Daily Meditations from the 39th President, 2011; as general editor, NIV Lessons from the Life Bible: Personal Reflections with Jimmy Carter, 2012; A Call to Action: Women, Religion, Violence, and Power, 2014; The Paintings of Jimmy Carter, 2014; A Full Life: Reflections at Ninety, 2015; The Craftsmanship of Jimmy Carter, 2018; and Faith: A Journey for All, 2018. In 1982, he became University Distinguished Professor at Emory University in Atlanta, Georgia, and founded The Carter Center. Actively guided by President Carter, the nonpartisan and nonprofit Center addresses national and international issues of public policy. Carter Center staff and associates join with President Carter in efforts to resolve conflict, promote democracy, protect human rights, and prevent disease and other afflictions. The Center has spearheaded the international effort to eradicate Guinea worm disease, which is poised to be the second human disease in history to be eradicated. President Carter and The Carter Center have engaged in conflict mediation in Ethiopia and Eritrea (1989), North Korea (1994), Liberia (1994), Haiti (1994), Bosnia (1994), Sudan (1995), the Great Lakes region of Africa (1995-96), Sudan and Uganda (1999), Venezuela (2002-2003), Nepal (2004-2008), Ecuador and Colombia (2008), and the Middle East (2003-present). Under his leadership The Carter Center has sent 107 election-observation missions to the Americas, Africa, and Asia. These include Panama (1989), Nicaragua (1990), China (1997), Nigeria (1998), Indonesia (1999), East Timor (1999), Mexico (2000), Guatemala (2003), Venezuela (2004), Ethiopia (2005), the Democratic Republic of the Congo (2006), Nepal (2008), Lebanon (2009), Sudan (2010), Tunisia (2011), Egypt (2011-2012), Kenya (2013), Mozambique (2014), Guyana (2015), Myanmar (2016), and Liberia (2017). The permanent facilities of The Carter Presidential Center were dedicated in October 1986, and include the Jimmy Carter Library and Museum, administered by the National Archives. Also open to visitors is the Jimmy Carter National Historic Site in Plains, administered by the National Park Service. Jimmy and Rosalynn Carter volunteer one week a year for Habitat for Humanity, a nonprofit organization that helps needy people in the United States and in other countries renovate and build homes for themselves. Since 2007, President Carter also has served as a member of The Elders, a group of independent global leaders. He teaches Sunday school and is a deacon in the Maranatha Baptist Church of Plains. For recreation, he enjoys fly-fishing, woodworking, and swimming. The Carters have three sons, one daughter, nine grandsons (one deceased), three granddaughters, five great-grandsons, and eight great-granddaughters. On December 10, 2002, the Norwegian Nobel Committee awarded the Nobel Peace Prize for 2002 to Mr. Carter "for his decades of untiring effort to find peaceful solutions to international conflicts, to advance democracy and human rights, and to promote economic and social development." Revised July 25, 2018 by Steven H. Hochman.